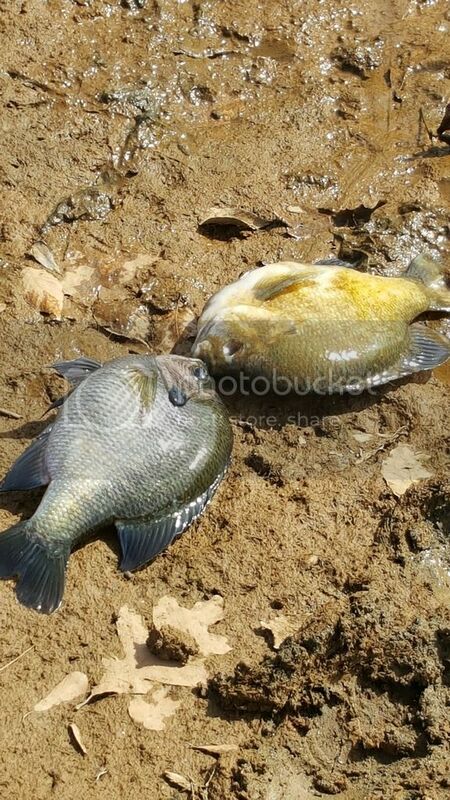 Yesterday I found a few dead bluegill and others swimming around not looking too good. Saw a few this morning swimming very slow and not looking good. The bass however are doing fine. There were several bass at the feeder yesterday when it went off that were taking pellets. Each time i have bg die, the bass seem fine. What water conditions is it that bg can't live in, but bass are fine? If I could figure that part out, then I might be able to correct the problem. Could it be oxygen, or do they both require about the same amount to live? It is almost always large male bg. Pond is about 2 acres, stays full, and right now about 30-40 gallons per minute are flowing thru, which will stay about the same all winter. We did have some big rain events in the last month here and the water got muddy for a week or so. Old age, stress from cold, enhancing natural die-off? What is upstream that might be toxic? Here in the south I doubt it would be the cold. This happens from time to time even during warm months. The bg are about 4 years old. I would think if it were old age, then it wouldn't come in stages. Of course I do see a single from time to time dead, but most of the time it is more than one. The backyard of a few older homes do backup to the place here my stream begins. from what i hear, phosphorus has been removed from detergent now and isn't harmful to streams. I never smell or see any signs of sewage. I cut the feeder off yesterday. I have read where feeding during cold weather can be harmful, but I believe that is long term health issues. Anyone know if feeding could result in almost instant death? Say within a week or so of eating during a cooler temps? Scott, I limit my feeding greatly in winter. I have found a couple of big male BG dead a couple days after feeding. Maybe they gorged and couldn't digest? The biggest ones do seem to get the most pellets. I only feed after a couple of unseasonably warm days when I can see the BG coming to me when I walk up. But, I am quite a way NW of you. I keep a tropical aquarium that is heavily planted. I constantly check the water conditions. ammonia, nitrites, nitrates, and ph. each can cause stress on aquarium fish. some handle certain conditions better than others. Would there be any test that i could do on the pond water that might point me in the right direction? The only thing I can think of is my pond may be too fish heavy. does overcrowding cause oxygen issues only, or do other things such as ammonia and nitrates come in to play? Also, would oxygen be an issue this time of year? You're a bit obsessive with the heavily planted aquarium. It will take care of itself unless overpopulated. All the stuff you speak of can happen. Oxygen is an issue any time of the year. If you have ice cover and no aerator, good chance you'll have dead fish. BG and LMB have about the same water quality requirements. From a history of your pond my guess is that carrying capacity is the issue with BG. If so more harvest might be in order. Auburn has a fish disease service. Might want to contact them as they are in your state. I am a bit obsessive with the aquarium. I went to Indonesia for 2.5 weeks and came home to all my adult guppies dead. I had an auto feeder and all I can think of is that I overfed. I have since bought a few expensive breeds of guppies and just want to make sure they make it. Plus I am self employed and kind of bored this time of year. Too cold and wet to do much asphalt work. Aquarium gives me something to do. About the pond, it is rare to get any ice on ponds here in Alabama. It happens, but not so far this year. Auburn University fisheries is only 30 minutes from me. My friend and I just had this conversation an hour ago. I need to call and see what they could do. Maybe a water sample or take them a dead fish. About carrying capacity-I never really understood how come stocking rates seem way higher than actual carrying capacity (adult fish) of a pond. I stocked 2500 bg and 150 bass. I have already caught a bg that weighed 1.9 lbs. Lets just say the bg average 1 lb and the bass average 3 lbs. (which some are much larger), that would be way higher than what a 2 acre pond can carry. I know we take fish from the pond from time to time, but even waiting a year or so before harvesting it would seem the pond would be way over the carrying capacity. scott69, where did you get the stocking recommendation of 2500BG and 150LMB?? WOW!!! I've never seen a recommendation of more than 250-300 BG/acre unless it was by someone that was also selling the fish. 75 LMB per acre might be possible if conditions were perfect I guess but 40-50 seems more appropriate. I'm completely missing something on these stocking rates I guess. I should be considering I'm from a different part of the country, but that sure seems extremely high to me..?? EDIT: I went and looked up your source. I assumed it was a publication..It is a supplier, I will apologize for my comments about "recommendations from a supplier", but I will not apologize for believing that is too high.. I believe it is. Snipe, i think the rates were high knowing i wanted a trophy bg pond and not bass. 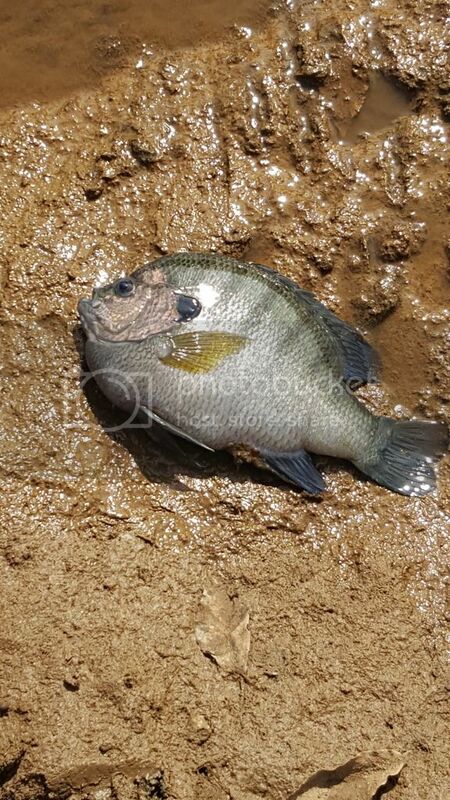 I think most suppliers/pond managers in our part of the country are just geared toward trophy lmb ponds and it goes in one ear and out the other when someone like me wants big bluegill. American sportfish are highly thought of, they are the ones that trademarked the Tiger bass. The other group in our area is Southeastern pond management. just for the heck of it, i just looked at their website and they recommend 1000-2000 per acre of bg. i really wish i would have went with very light stocking rates on the bg. FWIW I have often seen stocking recommendations here on the forum of 20 to 30 BG per LMB. I just spoke with an ext agent at Auburn University fisheries group. He said it is most likely a sickness related to bg only since the bass are fine. He said it could be anything from a bacterial infection, virus, fungus, or parasite. 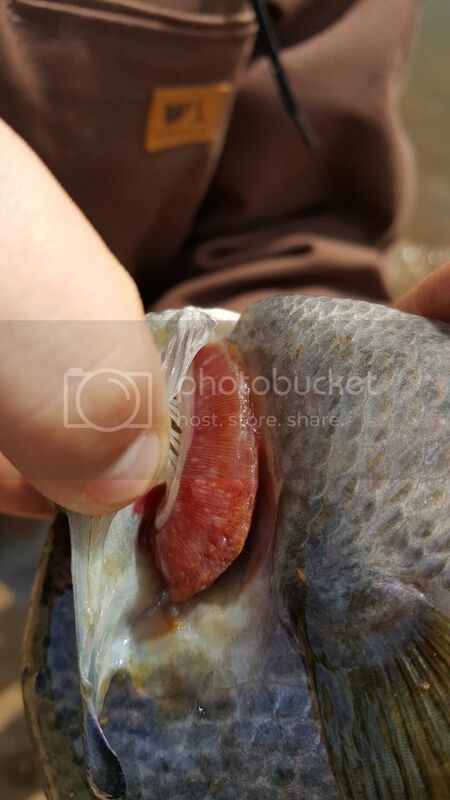 He said it happens even at their fisheries ponds. He said rarely is it a concern because it doesn't affect all the fish and bg spawn so much that the population always bounces back. He said a fish could be tested, but it is very expensive (how much $, he didn't say). He also said even if we did find out what the cause is, the treatment method would basically be the same, which is: remove any dead or sick ones. He said not to worry about winter feeding. make sure not to feed them more than they can eat in 10 minutes. Also said that he was most certain it isn't an oxygen issue since the largest bass are doing ok. Very interesting.. I guess I'm just not familiar enough with southern rates. Looks like a lot of that carrying capacity is being based on loading up on fertilizer also. I guess my personal thought is I'd rather stay on the lower side and error on the low side vs. teeter tottering on the brink of a crash any time there is a slight droop somewhere in the food chain. Just seems to me like they are hanging a lot out on a limb?? Good for me to learn too.. I've always bought into the 1,000 BG fingerlings per acre. Then add bass, 100 per acre, when there are enough groceries to feed them. It takes a heckuva lot of BG to feed bass. But, in warmer climates like Texas, bass need to be culled after the second or third year. They can pretty well decimate forage. 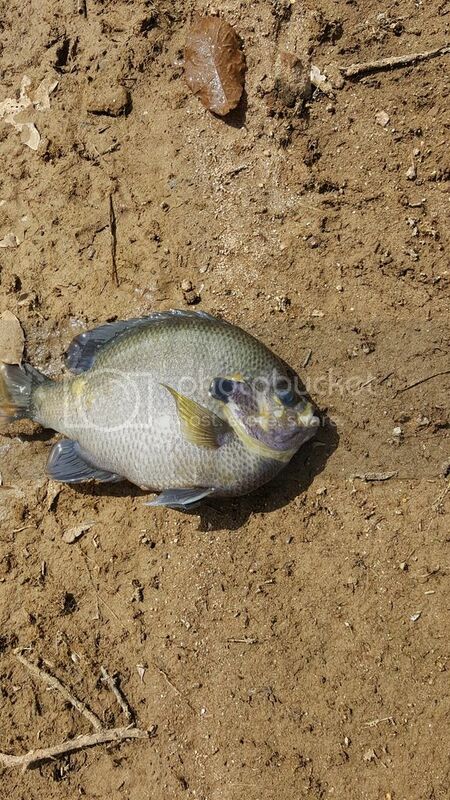 Number of BG or panfish/acre to stock is dependent on ones goals. "It all depends" as my limnology professor always taught. If one is interested in growing trophy BG then the stocking ratio changes to a lower BG:LMB ratio. Bill is correct. BG/LMB stocking numbers using 2-3 inch fish are highly dependent. The most recent BG to LMB stocking numbers for a LMB oriented pond (not necessarily trophy) in the south is 2500 to 3500 per acre. This has the effect of moving the time at which the LMB start encountering food shortages (small skinny LMB syndrome) out an additional year +. LMB stocking numbers are also variable ranging from 100 down to 30 per acre based on goals. 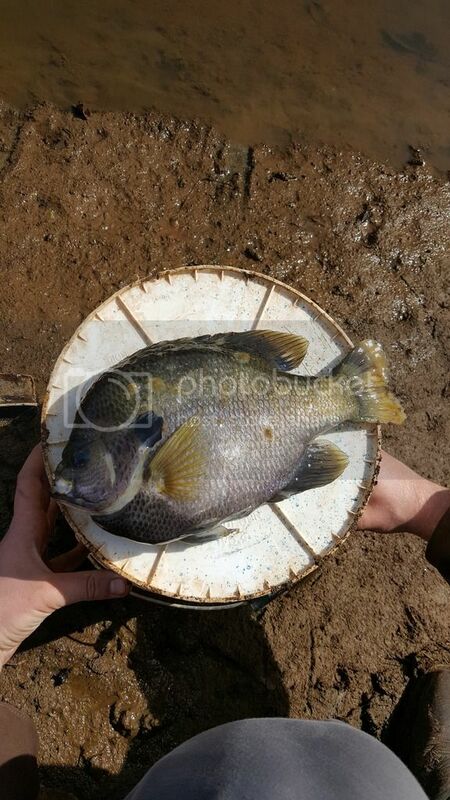 Carrying capacity in the south is reached rather quickly 18 to 24 mths and at that point you are managing how the capacity is divided between sizes/year classes of fish. Much like balancing on the edge of a knife blade. The old 1000/100 was originally based on 1930 era food production by USDA data and not for recreational ponds. Update. I have been lowering the pond for a week now. It is down about 40+ inches now. I have pulled probably 150 fish out dead this week. some are floating and some are on the bottom out of reach. some are covered in mud and silt and decayed badly, other are still dieing daily. I hope to be able to have a fresh specimen in the morning and I am taking it to Auburn University. They have agreed to check them for me. The fish can't be dead longer than 10 hours. I was able to scoop one this evening and put in a cage. Hopefully it will still be alive in the morning, if not I will try to find another sick one near the shore. Glad to hear you are taking one to a pro. Hopefully, they will be able to give a definitive answer and recommend a path forward.